We will consider the supplement Mentis Laboratories Doxiderol within this review. Doxiderol is advertised is as being ideal for studying students or hard working employees by increasing focus and alertness while reducing fatigue by boosting energy levels. Additionally it enhances memory and lengthens the attention span. Its ingredients and our thoughts on it can be discovered by reading more below. Citicoline raises choline levels and increase the level of neurotransmitters like acetylcholine. Vitamin B5 is needed to break choline into acetylcholine. Bacopa helps the cells of the brain to cope with stress, allowing the brain to function better in stressful situations such as exams. L-Theanine also reduces stress while improving mood and counteracts the negative effects of caffeine. Acetyl-L-Carnitine raises levels of the antioxidant glutathione and stimulates nerve growth, which results in neuron and synapse growth within the brain. Brain cells are protected and rejuvenated by this. Caffeine improves concentration and focus. The manufacturer outlines no dosage and they have not provided any snapshots of the labels on the back of the bottle so it is impossible to gauge the strength of Doxiderol based on the amount of ingredients or the recommended dosage. Outside sources gave conflicting information about Doxiderol dosage. One source said that two (2) capsules of Doxiderol should be taken every four hours while another said that it was recommended that Doxiderol only be taken once a day though the number of capsules that should be used was not noted. It seems that at least two or three capsules are required in order for the product to be effective although there is a definite worry of consuming more Doxiderol than it is safe to take. It is concerning that side effects are not listed by the manufacturer. This lack of information means that you cannot make an informed choice about whether to use this supplement or not. The only warning given by the manufacturer is to avoid alcohol while on Doxiderol and to read the warning labels printed on the outside of the bottle. Mentis Laboratories sell a 30 capsule bottle for $34.95 but it is cheaper to buy Doxiderol in bulk. Two 30 capsule bottles will set you back $59.42 while a 90 capsule bottle will cost you $78.64. Mentis Laboratories have made a 90-day money back guarantee available. It allows you to return Doxiderol after opening but the amount of the product remaining impacts the refund. If less than 80% of the product is returned then the refund will be reduced accordingly. If more than 80% is returned then a full refund will be issued by the manufacturer. Positive reviews have been received indicating that the product was well received and is effective. However, most of these reviews are from 2013 or earlier. The product has not been reviewed recently, which might imply a drop in popularity or that people are just not bothering to leave them. 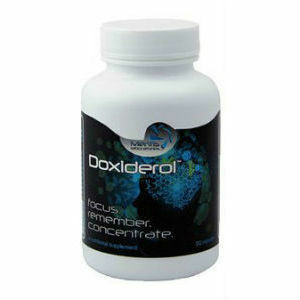 Doxiderol appears to have been received positively by consumers, which suggests that it is effective. It also comes with a very reasonable guarantee given the timeframe given and the reduced refund makes sense. However, you are likely to try more of the product than only 20% if you want to be certain of the effects so you have a strong possibility of only receiving a partial refund. The dosage of the product raises questions also as it is not outlined anywhere on Mentis Laboratories’ website. This means that you cannot have an idea of the effects, especially as the strength of the key ingredients is unknown as well. If the dosage is high then that can adversely affect cost, requiring the purchase of a lot of the product in order for it to be effective. If a month’s dosage were as high as 90 capsules then a month’s supply would cost over $70 dollars, which seems excessive. Lastly, the lack of listed side effects means that you do not know what you are getting yourself into when you purchase the product. Overall, the product seems to lack readily available information that would be necessary to make an informed decision before trying Doxiderol. Henry Costa	reviewed Mentis Laboratories Doxiderol	on November 20th	 and gave it a rating of 3.